This peaceful and well located villa allows you time to relax and unwind by the pool and also the opportunity to experience the glamour and entertainment of St Tropez. The villa is a short distance from Pampelonne Beach and 5 mins by car to Club 55 and Nikki Beach. It's perfectly suitable for families and there is a path and cycle track down to the beach. It is located close to the beautiful hill top town of Ramatuelle which has a summer festival of arts during August and tennis facilities available. The first floor of the villa is completely renovated to an exceptionally high standard and features an open plan living area with beautiful terraces and views towards the lighthouse at Cap Camarat; Bulthaup kitchen with Gaggenau appliances; WiFi and satellite channels. There is a fully equipped summer kitchen, BBQ and covered seating by the pool. London based owners with a local manager and an on site caretaker. As soon as we walked through the gates into the garden we knew we had to buy this villa. It was perfectly peaceful and beautiful. We love the relaxed holiday feel of the villa. The location immediately puts you into holiday mode. It's close to the beach, the port of St Tropez and the hill towns of Ramatuelle, Gassin and Grimaud. Even in the height of the busy summer months it's a haven. It's location also means it has excellent access into St Tropez unlike other properties located along the St Maxime- St Tropez route. The gardens are stunning and are a tribute to our hard working 'guardian' gardener who is out in all weathers. It's wonderful to be able to walk to the beach even during winter when the air is so clear and you can just see the foothills of the Alps in the distance. The villa has 5 bathrooms. All bedrooms have en suite bathrooms with showers. The master bathroom has a walk-in shower and separate freestanding bath. There is also a separate guest toilet. Full air conditioning throughout the villa. Linen and towels including pool towels are provided. We have two washer/ dryers. Large open plan living area opening on to south facing terrace overlooking the countryside. Flat screen TV, DVD and Bose system. Satellite channels. Fireplace. Dining for 10 people.Wi Fi and internet. Air conditioning. There are two dishwashers. One in the main kitchen and one in the pool house. Both kitchen are fully equipped with cutlery, crockery and utensils. The villa has 2 kitchens both fully equipped.The Bulthaup kitchen inside the villa is fitted with Gaggenau appliances, large American fridge and breakfast bar. The summer kitchen by the pool is fully equipped and has a family size gas BBQ. Televisions are available in all bedrooms. Boat hire is available nearby. There are nearby tennis clubs which are available to non members. Gassin Golf Country Club - approximately 15 minutes. Notes on accommodation: The layout of the villa is on two levels with the master bedroom, guest bedroom and living areas upstairs opening onto terraces to the south and west giving this area a very open and spacious feel. The terraces have views over the countryside towards the lighthouse at Cap Camarat and vineyards. There are three independent bedrooms with bathrooms downstairs. Two open onto the garden and the third is a large studio room with a view of the pool. This is a bedroom and a sitting area and can accommodate 4 people making it ideal for families with staff. Baby cots and high chairs are available. All rooms inside the villa are air-conditioned or heated in low season. We have an on site caretaker who maintains the pool and the gardens area. Outside: The villa has 2 large terraces on the first floor overlooking the pool and countryside perfect for watching the sunset. The private pool is approx. 12m x 6m with sunbeds and lounging areas. Pool heating is available on request. The villa is set in 2600 sq.m. of mature landscaped gardens with fig, olive, palm trees and water features. The gardens are fully enclosed and flat making it ideal for small children. The trees can be flood lit in the evening giving the gardens a wonderful magical feel. The Pool house kitchen is fully equipped and has a large Weber gas BBQ. The covered terrace by the pool is furnished with contemporary Dedon furniture - perfect for lounging and dining. We have covered parking for 4 cars and easy additional parking for up to 10 cars. The pool has an alarm system. A security barrier is available. Pets may be accepted - please contact us. Utility Room: Laundry room with large washer/dryer. Steam iron. Vacuum cleaner. Cleaning / Towels / Linen / Maid service: Linen and pool towel hire is included. Daily maid service, chef and chaffeur can be arranged on request at an additional charge. The gardens and pool are maintained on a daily basis by our on site caretaker. Other: Outdoor pool house with a fully equipped kitchen and outside dining areas. Large family size gas BBQ. Books, CDs and music library. Table tennis. Excellent Villa. The upstairs bedrooms and living space are very good. Great garden looked after by a very helpful Angelo, who lives at the back of the villa but he does not appear unless you need him. Outdoor fully equipped kitchen & BBQ area is very good with everything you need. Good pool and clean. Beaches within a few mins car ride or a 15 min walk from the villa. Very good Spa supermarket within 5 mins drive which has just about everything. We would go back to this villa. Thank you for taking the time to write a review and for the kind comments.It was a pleasure to have you stay with us. We loved the location: close to beach & charming villages; easy access to St. Tropez. The setting is lovely with room for outdoor games and activities. The outdoor kitchen is so convenient and well equiped. The pool is very central to all the activities and great children and adults. The bedrooms are all cool and comfortable with very good beds and lovely linens. The bathrooms are all updated as is the upstairs kitchen, living room, and upper terraces with expansive views. We loved the gardens and the scent of all the Provencal flowers and plants. There are many restaurants and other amenities close by. The caretaker is delightful and so helpful. The owner and property manager we're also very helpful and accommodating. Thank you all so much. We stay at this villa every May for a wonderful week of relaxation and privacy whilst being located close to all the Ramatuelle beach clubs which are within walking distance of the property. The property boasts a wonderful master bedroom suite with balcony over the magnificent pool and superb outdoor kitchen. Other 4 other bedrooms in addition mean this villa is spacious and within beautiful gardens maintained by the wonderful Angelo who keeps an eye on everything. Every time we leave this villa we leave a little bit of our hearts behind ! Thank you so much. We really appreciate you staying with us. Great location close to the beach. Lovely villa. We appreciated the air conditioning in all the rooms as it was pretty hot. We are hoping to come back next year! We stayed at The Grande Vigne Villa 2 weeks ago and I and my family had the most wonderful time. The Villa is in a great location which is so peaceful, the garden is stunning and it's just a short stroll to the beach if we want to go there, it's also easy and quick to get into the centre of St Tropez. There is a wonderful general store (The Spa) near by where we picked up fresh bread and croissants for breakfast every morning. Everything we need is in the house and it’s a pleasure to have a holiday rental property where clearly the owner has thought about their guests comfort, the games and puzzles kept us all entertained and the CD collection is awesome! The rooms are all of a good size, the beds incredibly comfortable and are comfortably furnished, the Pool house is brilliant for dining and cooking in the sunshine. The house is spotlessly clean and with all linen provided, I would have no hesitation in recommending La Grande Vigne and look forward to hopefully booking again next year. The world famous Pampelonne beach with its fantastic restaurants and beach bars is a few minutes from the villa. Club 55 and Nikki beach are 5 minutes by car. Toulon -Hyeres (50km approx 50 mins). Marseilles, Marignane (110km 1 hour 45 mins). There is a heliport at Grimaud (12km) with airport transfers from Nice and VIP transport. There are direct daily trains from Paris to St Raphael which is the nearest station. Then by taxi. 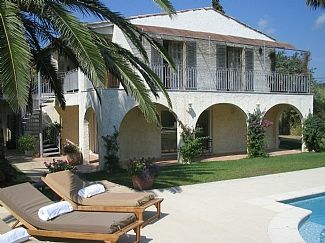 The villa is 2km from Ramatuelle village and 5km from St Tropez village. The villa is located to the south of St Tropez port and has easy and quick access into the town and the port area during the very busy months of July and August. There are many popular restaurants in St Tropez and along Pampelonne beach. The villa is close to the beach restaurants, Tropicana and Cantine Bambou and a 5 minute drive to the famous Club 55 and Nikki beach. The hill towns of Ramatuelle, Gassin and Grimaud are a short drive with good local restaurants and beautiful views towards the sea. There is an excellent market in St Tropez on Saturday and Tuesday mornings and a smaller version in Ramatuelle on Sunday mornings. St Tropez itself is a wonderful small fishing village with winding streets and many shops and restaurants. There is a local supermarket close to the villa (5 minutes by car) with a fresh fruit and vegetable market, fresh fish and meat counter, bakery and newsagent. A good place to pick up a fresh baguette and croissants each morning. Booking Notes: To make a reservation or check availability please email or call us. A reservation can be held for 3 days. Once an option has been accepted you must return the completed rental agreement with a deposit for the rental. A deposit of 30% of the total rental price is required to reserve the villa. The remaining 70% and an insurance security deposit must be received 6 weeks prior to the rental period. Changeover Day: The preferred changeover day is Saturday but we are happy to be flexible with timings and days subject to other client bookings. Notes on prices: Prices shown are in euros per week. The rate includes linen and pool towel hire, normal utility usage (electricity usage up to 150€ per week) and 6 hour mid week maid service and end of stay clean. Additional cleaning and maid services, chef and chaffeur services can be arranged on request. For rentals in excess of one month please contact us . For rentals in the low season and outside of these periods please contact us.